The Boston Terrier breed originated around 1870, when Robert C. Hooper of Boston purchased a dog known as Hooper's Judge, who was of a Bull and Terrier type lineage. Judge's specific lineage is unknown; however, Hooper's Judge is either directly related to the original Bull and Terrier breeds of the 18th and early 19th centuries, or Judge is the result of modern English Bulldogs being crossed into terriers created in the 1860s for show purposes, like the White English Terrier. Judge weighed over 29.7 pounds (13.5 kilos). Their offspring interbred with one or more French Bulldogs, providing the foundation for the Boston Terrier. Bred down in size from pit-fighting dogs of the Bull and Terrier types, the Boston Terrier originally weighed up to 44 pounds (20 kg.) (Olde Boston Bulldogge). The breed was first shown in Boston in 1870. By 1889 the breed had become sufficiently popular in Boston that fanciers formed the American Bull Terrier Club, but this proposed name for the breed was not well received by the Bull Terrier Fanciers; the breed's nickname, "roundheads", was similarly inappropriate. Shortly after, at the suggestion of James Watson (a noted writer and authority), the club changed its name to the Boston Terrier Club and in 1893 it was admitted to membership in the American Kennel Club, thus making it the first US breed to be recognized. It is one of a small number of breeds to have originated in the United States. The Boston Terrier was the first non-sporting dog bred in the US. Boston Terriers are typically small, compactly built, well proportioned dogs with erect ears, short tails, and a short muzzle that should be free of wrinkles. They usually have a square sort of face. The smooth coats of the Boston Terriers are mainly brindle, seal or black with even white markings. The Boston Terrier is characteristically marked with white in proportion to either black, brindle, seal, or a combination of the three. Seal is a color specifically used to describe Boston Terriers and is defined as a black color with red highlights when viewed in the sun or bright light. Black, Brindle, and Seal (all on white) are the only colors recognized by the AKC. There are also liver, brown, cream or red and white Boston Terriers, however these markings are more rare than the others listed above, and are disqualified from AKC events. If all other qualities are identical, brindle is the preferred color according to most breed standards. Ideally, white should cover its chest, muzzle, band around the neck, half way up the forelegs, up to the hocks on the rear legs, and a white blaze between but not touching the eyes. For conformation showing, symmetrical markings are preferred. Due to the Boston Terrier's markings resembling formal wear, in addition to its refined and pleasant personality, the breed is commonly referred to as the "American Gentleman." The Boston Terrier is a gentle breed that typically has a strong, happy-go-lucky and friendly personality. 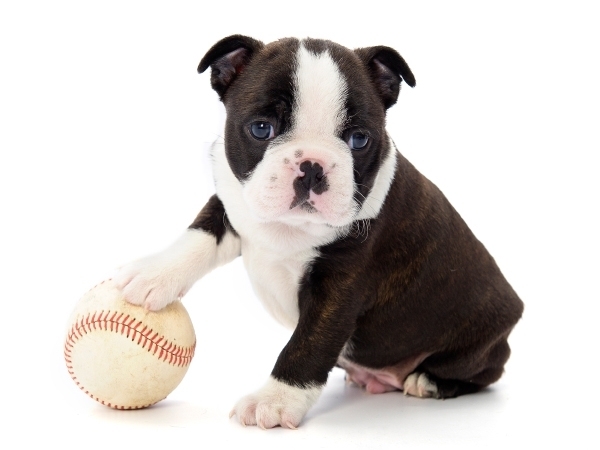 Bostons are generally eager to please their owner and can easily be trained given a patient owner. While originally bred for fighting, they were later down bred for companionship. The modern Boston Terrier can be gentle, alert, expressive and well-mannered. It must be noted however, that they are not considered terriers by the American Kennel Club, but are part of the non-sporting group. So the terrier part of their name is something of a misnomer. Both females and males are generally quiet and bark only when necessary. Their usually sensible attitude towards barking makes them excellent choices for apartment dwellers. Having been bred as a companion dog, they enjoy being around people, and if properly socialized, get along well with children, the elderly, other canines, and non-canine pets. Several health issues are of concern in the Boston Terrier: cataracts (both juvenile and adult type), cherry eye, luxating patellas, deafness, heart murmur, and allergies. Curvature of the back, called roaching, might be caused by patella problems with the rear legs, which in turn causes the dog to lean forward onto the forelegs. This might also just be a structural fault with little consequence to the dog. Many Bostons cannot tolerate excessive heat and also extremely cold weather, due to the shortened muzzle, so hot or cold weather combined with demanding exercise can bring harm to a Boston Terrier. A sensitive digestive system is also typical of the Boston Terrier. In the absence of proper diet, flatulence is associated with the breed. In some cases, even a proper diet cannot abate flatulence. Bostons, along with Pug, Shih Tzu and other short-snouted breeds are brachycephalic breeds. The word comes from Greek roots "Brachy," meaning short and "cephalic," meaning head. This anatomy can cause tiny nostrils, long palates and a narrow trachea. Because of this, Bostons may be prone to snoring and reverse sneeze, a rapid and repeated forced inhalation through the nose, accompanied by snorting or gagging sounds used to clear the palate of mucus, but does not harm the dog in any way. Bostons frequently require caesarean section to give birth, with over 90% of litters in a UK Kennel Club survey delivered this way.